The Boyfriend and I had a free afternoon since his class was canceled so we decided to try something we’ve never had before and can’t have normally. I instantly thought about Ippudo, which boasts 45 minute to 3 hour waits for dinner on a normal basis. We headed over on a weekday afternoon and arrived at about 1:30pm. The Boyfriend went into to give them his name while I stayed outside to wait. Our quoted time was 20 minutes, which wasn’t bad at all. The actual wait was around 30 minutes but it was a nice day out so we didn’t mind. We were seated on a bar-style table and given menus to look over. 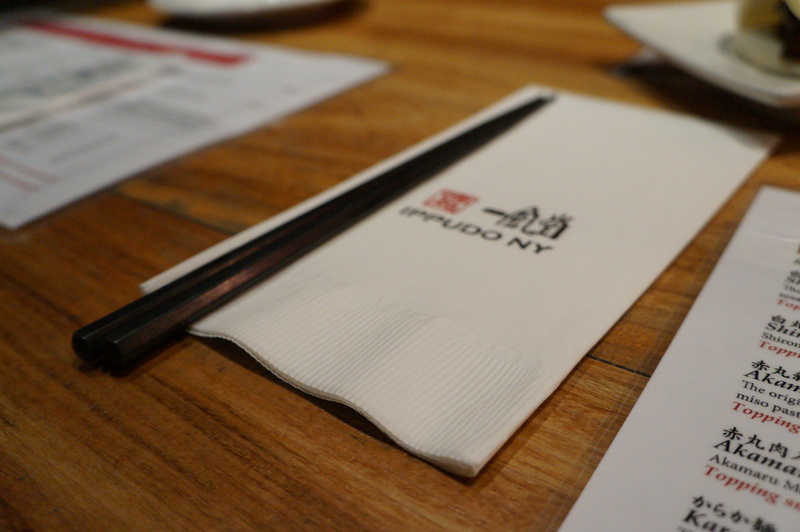 Ippudo uses real chopsticks instead of the splinter-laden wooden ones most Asian restaurants offer. This made my ramen experience that much better! 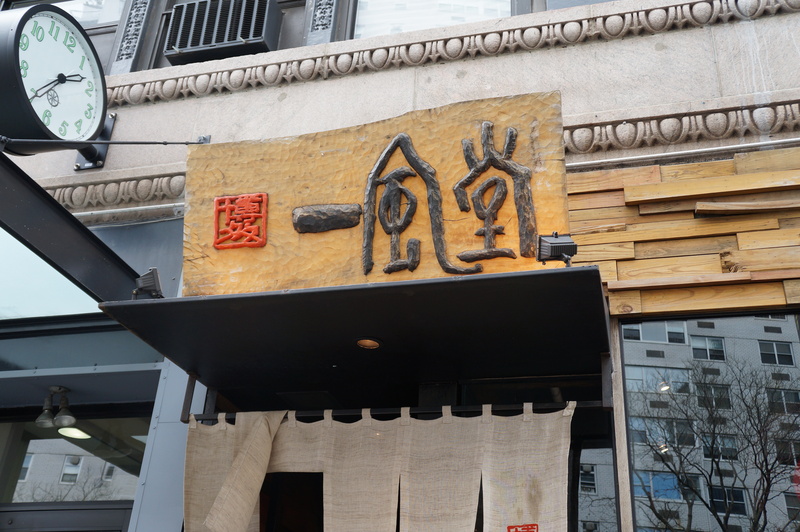 We decided to order their Hirata Buns (2 pieces for $9.00), which features steamed buns filled with your choice of pork or chicken. 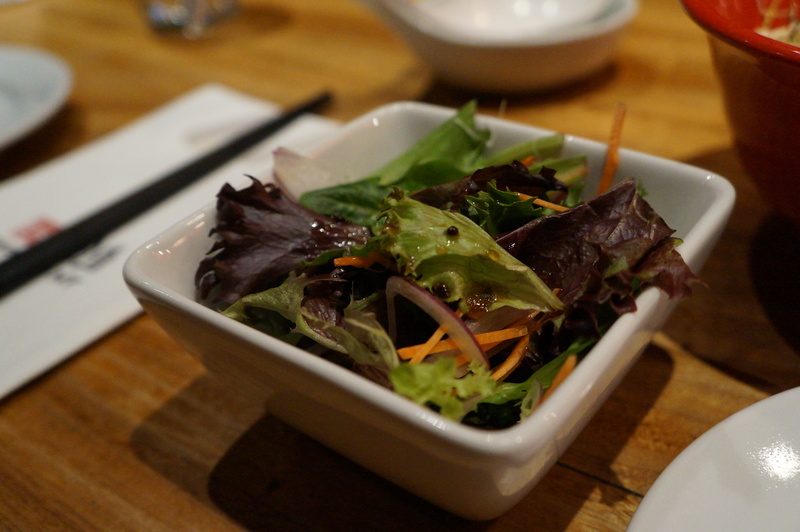 It’s served with Ippudo’s spicy sauce, mayo and lettuce. And boy, were these buns good. I’m always a fan of anything inside steamed buns because I love the buns themselves. But the filling for these buns definitely stole the show. The pork was tender and juicy. Ippudo’s spicy sauce wasn’t too spicy and blended well with the mayo. 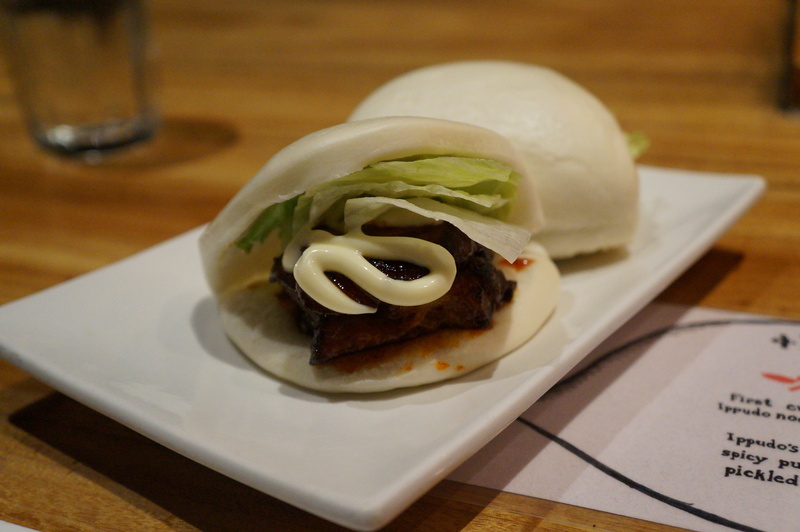 These pork buns are a definite must get! 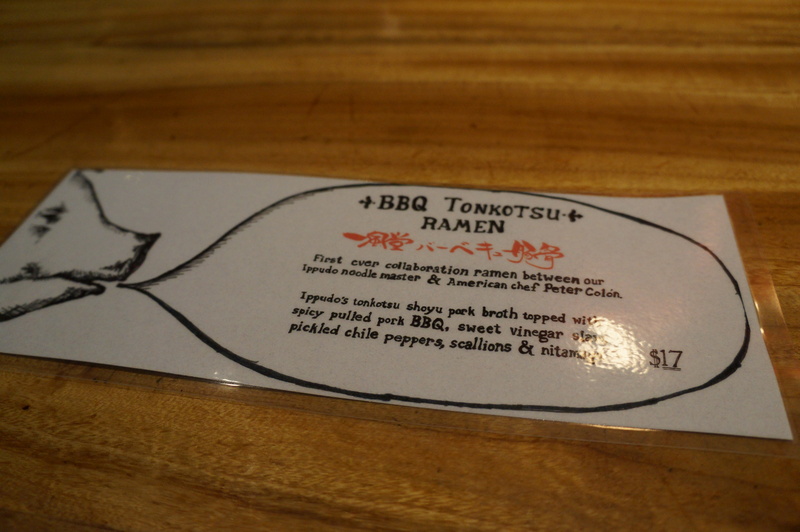 The Boyfriend opted for their special BBQ Tonkotsu Ramen ($17.00), which is a collaboration between Ippudo’s noodle master and American chef Peter Colon. 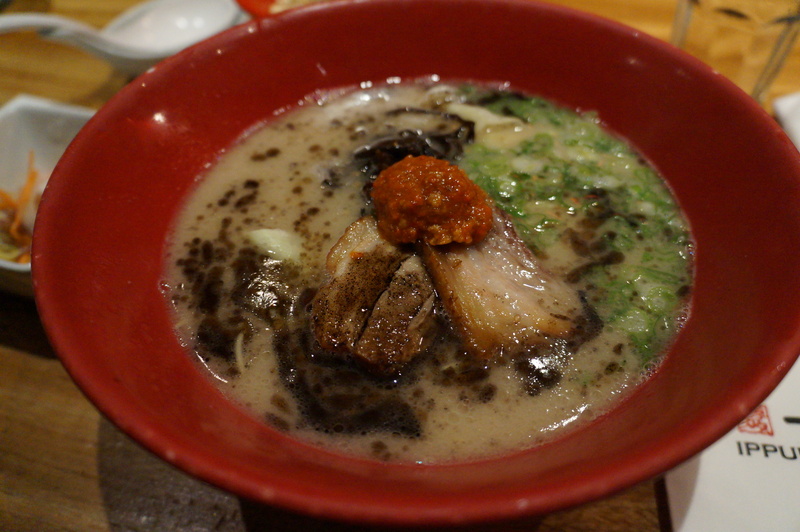 The dish features Ippudo’s tonkotsu shoyu pork broth topped with spicy pulled BBQ pork and vinegar. The Boyfriend thought it was quite and so did I. 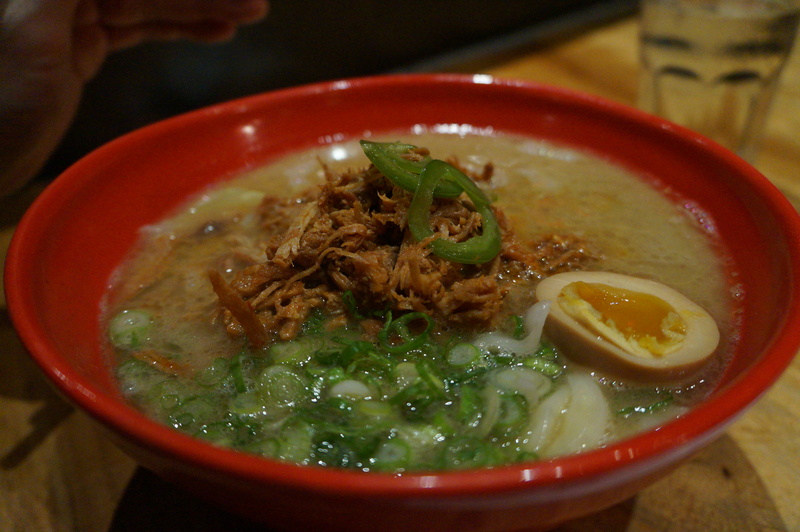 The broth was flavorful and the ramen was vey tender and bouncy. He decided to get his ramen as a lunch set, which for $3 extra comes with a mini salad and your choice of a rice dish. We opted for the spicy cod roe over rice, which the Boyfriend has fallen in love with ever since we had cod roe at Sakagura. Both were a nice and cute addition to our meal. I opted for the Akamaru Modern Ramen ($14.00), which features Ippudo’s original “Tonkotsu” pork soup noodles topped with their secret “Unami Dama” miso paste. The soup is mixed with fragrant garlic oil and cabbage, mushrooms and scallions. This was the best bowl of ramen I have ever had. They put their secret miso paste on the top of the broth so you have to mix it in thoroughly for it to work. But once you do, it is the most delicious broth on earth. The broth has this extra kick to it that you don’t get with regular tonkotsu soup bases. Even the Boyfriend said my bowl of ramen was better than his! Our food arrived quickly and efficiently. Despite the amount of people waiting outside, we never felt rushed to leave. They even give you a cup of hot hoji-cha after your meal to balance out the salt and spices. The ramen was a bit on the expensive side but we were both so full and so satisfied that we couldn’t complain. 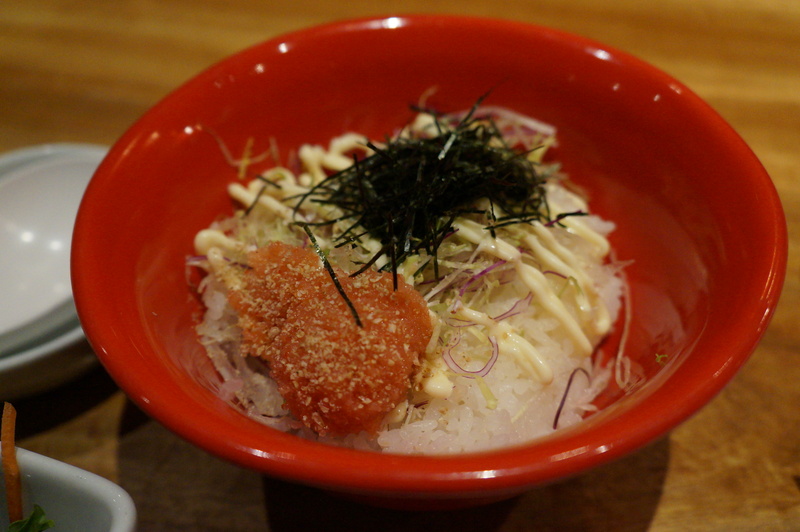 If you have the time to wait, I really suggest paying Ippudo a visit. It’s a bowl of ramen you will never forget!